The story of Ficus pollination is a fascinating one as fig trees do not have flowers that are accessible to normal pollinators – the flowers are inside the “fruit”. The fruit of the genus Ficus is unique and is derived from a hollow peduncle that becomes fleshy and becomes the “fruit” called a syconium. The unfertilised ovaries provide the resin-like flavour associated with the fruit of a fig. Fruit can contain a closed or an open ostiole, or eye, located at the fruit apex. The Syconium is formed by an enlarged, fleshy, hollow receptacle with multiple ovaries on the inside surface. 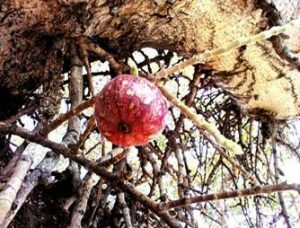 It is really a fleshy stem with a number of flowers, so it is considered both a multiple and an accessory fruit. The name comes from the ancient Greek word sykon meaning fig. Evolution: The syconium is thought to have first evolved 83 million years ago in the Cretaceous period. As the bracts protecting the inflorescence tightened to form the ostiole, greatly increasing the pollinator specificity of the plant, this initiated a long and complex history of co-evolution between figs and their pollinating wasps. 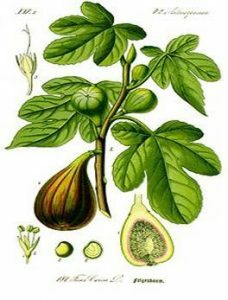 There are around 755 species of fig in the world, 113 of them in the Afrotropical region and 36 in the southern African region. Every species of fig has it’s own associated wasp species and conversely every wasp is associated with a specific Ficus species. This is known as obligate mutualism. The syconium is an urn-shaped receptacle which contains between 50 to 7000 highly simplified uniovulate flowers or florets (depending on the species) on its inner surface. It is closed to most organisms by the ostiole, formed by bracts. Syconia can be monoecious (a plant with unisexual flowers, the male and female flowers borne separately on the same plant) or functionally dioecious (a plant with unisexual flowers, the male and female flowers borne on different plants). Monoecious figs contain female flowers with variable style length and a few male flowers – they produce seeds and pollen. Once pollinated the florets develop into achenes or drupes in which the seeds are enclosed by a layer of endocarp. From this perspective, the fig is an enclosure with tens to thousands of fruits within it. Development: Formation of the syconium begins with the initial growth of bracts, which curve to form a receptacle. When the outer bracts meet, they form the ostiole by interlocking. Syconia may also develop lateral, basal or peduncular bracts. There is a relationship between the shape of the ostiole and the morphology of the wasps that pollinate the fig. 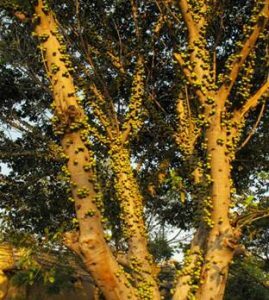 Pollination: About half the Ficus species are monoecious, the other half being diecious (males and females on different trees). Let us start with the monoecious life cycle. 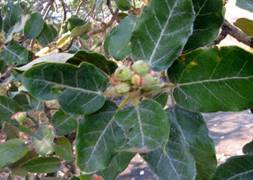 Here the male and female flowers are contained in the same fig but their reproductive cycles are several weeks apart. As the pollinating wasps’ lifespan is only a few days, pollen dispersal is continued by the next generation of wasps. The tight ostiolar enclosure at the apex of the syconium makes the figs highly pollinator specific. When receptive to pollen, the ostiole slightly loosens, allowing the highly specialised wasps to enter through it. The wasps may lose their wings in the process and once inside they pollinate the female flowers. Some of the florets have styles longer than the ovipositor of the wasp and no egg is deposited in them, letting them develop as normal fruits. The wasps lay their eggs in the florets with shorter styles, which then form galls. The wasps die and the larvae develop in the galls, while seeds develop in the pollinated flowers. Four to six weeks after egg laying the wingless male wasps emerge, mate with the females still in their galls and cut a tunnel out of the syconium. As the females subsequently emerge they collect pollen on their bodies from the male flowers which have ripened later. After the wasps have emerged, chemical changes take place in the receptacle and it develops into a fruit. In dioecious figs the male and female fruits are borne on different trees. The male flowers all have a short style which allows the wasp to lay eggs in every floret. These produce wasps that become loaded with pollen before leaving the fig in which they have bred. The young wasps go in search of suitable fruits but they cannot differentiate between male and female fruits. As they enter a female fruit they fertilise the florets with the pollen collected in the male fruit, but because the style of all the florets in the female fruits are too long for the ovipositor of the wasp, no eggs can be laid in them and the floret has its normal development into fruits.